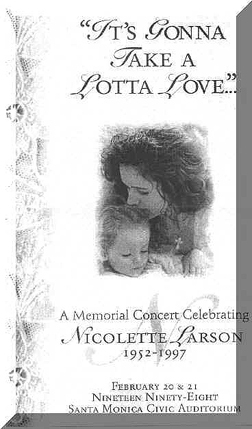 February 20 and 21, 1998 - in Santa Monica, California at the Santa Monica Civic Auditorium, there were two concerts in memory of Nicolette Larson (who died in December 1997) to benefit UCLA Children's Hospital. I'm going to try to review both shows at the same time since they were nearly identical in the set lists. I'll try to point out the differences between the two shows as I go. By the way, I got extremely lucky with fabulous pit seats both nights. The first night I was in the 2nd row, just a few feet from the stage and just a couple seats left of center. The second night I was in the 3rd row, a bit to the right side. My wife accompanied my the first night. One of my best friends joined me the second night. A nice concert program with a full color photo of Nicolette and her daughter on the cover was handed out as we entered. And I still don't like the sound at the Santa Monica Civic Aud., but it is a nice, fairly intimate setting with just 3,000 seats. At about 8:15 P.M. Tom Campbell (of Avacado Productions/The Guacamole Fund) came on stage first to welcome everyone and express thanks to those who deserved it. He then introduced the director of UCLA Children's Hospital who thanked everyone for coming and mentioned that the money from these shows was going to an endowment for a fund in Nicolette Larson's name to help children in need. A special Nicolette Larson room will be set up at UCLA Children's Hospital. Graham Nash and Russell Kunkel came on stage next. Russell Kunkel, besides being one of the top session drummers of all time, was Nicolette's husband. Graham and Russell are very close friends and were the ones who put these shows together. They thanked everyone for coming and told us that we were in for one heck of a show. On the first night, Graham said "Hold On To Your Hats!" On the second night they also introduced actor Robert Hayes, who was the master of ceremonies both nights. For some reason they didn't do this the first night. Then the curtain opened to reveal nearly everyone who participated in the evening. All the performers did a terrific rendition of "Lotta Love". This was the song that was Nicolette Larson's biggest solo hit. It was certainly appropriate for the night, but I was surprised by using this as an opening song. With the full group of performers on stage singing Nicolette's biggest hit, it felt like we were watching the encore first!!! David Crosby, Graham Nash, Bonnie Raitt, Jackson Browne, Carole King, Valerie Carter, and Rosemary Butler all did a great job on this song. On the first night the verses were handled by Carole King, Bonnie Raitt and then Valerie Carter. On the second night Rosemary Butler took the third verse. They were backed by the supersessions group known as The Section. (More on them later.) It was very surprising and got the concerts off to a fabulous and exciting start. But of course, I couldn't see how it could get any better from there... It did. After everyone exited. Robert Hayes introduced Little Feat as "a legendary L.A. band". His emphasis on the fact that their leader was Lowell George who was no longer with us was a bit uncomfortable. He really seemed to place emphasis on that for some reason which I thought very odd since he died more than 18 years ago! Litte Feat kept the pace up right from the start. For those that haven't seen them before, you are missing something special. For those that are big Little Feat fans -- and there were many there -- this was probably the highlight of the evening. Little Feat started out with "All That You Dream". Then they played "Down on the Farm" which was introduced as a song they used to play with Nicolette when they were touring Japan together. Bonnie Raitt and her longtime bass player Freebo then came out and joined Little Feat for "Cold Cold Cold", which was simply wonderful. (By the way, you can find the song "Cold Cold Cold" performed by Bonnie Raitt and Little Feat on the Lowell George Tribute Album Rock N Roll Doctor. This is the same album with Jackson's wonderful version of "I've Been The One".) The last song in the set was "Dixie Chicken". Between Bonnie Raitt and Little Feat, I've NEVER seen better slide guitar. It was only the first of many times I'd be sitting there simply amazed. The first night Bonnie commented that playing with Little Feat was like riding a great horse. "If you want a good ride you have to have a saddle that fits, but sometimes you get an even better ride without a saddle!" The second night she mentioned that she "always wanted to be stranded on a desert island with Little Feat", and "that back in the 70s it sometimes felt that way!" Then Little Feat left the stage but Bonnie Raitt stayed on and played a very emotional and heart-renching version of "Love Has No Pride". The song was played as an acoustic song with David Crosby and Graham Nash on harmony vocals. For me, Bonnie Raitt was one of the highlights of the shows and this song was simply incredible. (Ironically, I remember it as a Linda Ronstadt song and Linda was performing later the same evening.) Bonnie seems to get better everytime I see her. She sounded (and looked) simply the best I've ever heard her. At this point The Section came on and played a great instrumental. One of the real focus points of the evening was this band that acted as the backup band from this point on through the rest of the entire show (with the exception of the CSN set). The Section was a group made up of some of the very best session and backup musicians in the industry. Waddy Wachtel on guitar, Lee Sklar on bass, Russell Kunkel on drums, Lenny Castro on percussion, Steve Farris on guitar, Craig Doerge on keyboards, and John Gilutin on piano. Rosemary Butler and Valerie Carter sang backup -- except for this one instrumental song, of course! These musicians have backed all the stars that played at these shows on their albums and tours through the years. It was pointed out -- several times -- that many of these people had backed these artists for around 30 years!!! Nearly every peformer commented on how incredible this band was. I certainly would agree. They were simply amazing throughout both shows. Graham Nash then introduced Joe Walsh. Joe had just had surgery on his left hand. He came out wearing a HUGE cast. His thumb was completely encased in several inches of the cast. Not letting that stop him he performed "Pretty Maids"/"Tell Me Why", then "Rocky Mountain Way". I heard many people after the shows say that they felt this was the highlight of the shows. It was certainly one of many. Dan Fogelberg was next up. The first night he was o.k., but the second night he was much better. (Just my opinion.) I'm not sure why but he just seemed to be having more fun the second night. He opened his set both nights with "Phoenix" which didn't really do much for me. However he stepped it up with his two remaining songs. The first night he played "Run For The Roses" and the second night he played "Leader Of The Band" which was a request from Nicolette Larson's mother who was in the audience both nights. Both nights he mentioned that he never had attended a high school reunion but imagined that this was likely what it felt like. I felt his comments the second night were among the most sincere of any during either show. Dan finished his set with "Part Of The Plan" with Joe Walsh and Graham Nash helping out. Graham Nash came on stage and talked about how Nicolette and Russ and their daugher Elsie May had come out during the holidays to stay with him and his family at their home in Hawaii for the past 6 or 7 years. He talked about all the friends that they had in Hawaii and that one of them came out to perform a song he wrote for Nicolette. He introduced Michael Ruff. Michael introduced his song by saying that it had just come to him one morning and that it was later that same day that he found out that Nicolette was ill and probably would not make it. The song was called "Wonderful Life" and he accompanied himself on piano. Very nice. Then Carole King took the stage. She started out with "Up On A Roof". Her second song, "The Reason", she introduced as a new one she recently co-wrote that is the first track on Celine Dion's new album. For that song, a third singer joined Valerie Carter and Rosemary Butler on backup vocals. Afterwards, she introduced her as her daughter, Sherri Goffin Condor. (Sherri's father is Gerry Goffin with whom Carole has written some of the best songs of the past 25 years.) Then Carole sang "Child Of Mine" which she said she wrote for her daughter when her daughter was just 8 years old. During the song, Sherri came on stage and made a duet of it. And then torward the end of the song, Sherri motioned her daughter onstage and the duet continued while focusing on Sherri's 8-year old daughter, Sophie. I don't think there was a dry eye in the place and even thinking about it now gets me all teary-eyed. It was just beautiful. Afterwards, Carole confirmed that that was Sherri's daughter and said that she was deliberately avoiding using the "G-Word". However, on the second night she talked of how proud she was to be a grandmother and making a comment about how even grandparents can still rock!! She then finished up with a rocking version of "I Feel The Earth Move". Carole King is a consumate performer. I felt privileged to have been there. INTERMISSION. 20 minutes the first night. 15 minutes the second night. After intermission, Peter Max came on stage and presented some paintings he had done to honor the occasion. (The second night he wasn't there and the paintings were presented in his name.) Peter is one of the best known artists of concert and rock posters. His stylized paintings of Nicolette were wonderful. One will be hung in the Nicolette Larson room at UCLA Chilrens' Hospital and one is being given to Elsie May. Jackson Browne was next. Jackson spent a moment to send regards from John David Souther. He said that J.D. would like to have been there, but he was in Oregon doing a benefit that Nicolette had asked him to do. It seems Nicolette had been doing a particular benefit in Oregon for some school that was using the money to get a music program going after budget cuts had wiped it out. This was the first year that Nicolette hadn't been there and J.D. was doing it now. Jackson sat down at the keyboard (alone) for a very moving version of "For A Dancer" which is particular fiting at these types of occasions. Then he played a great version of "Walking Slow" and finished with the best version of "Running On Empty" I've heard since the late 70s. Something about Rosemary Butler on the backing vocals that really adds to this song. You'll remember that the "Running On Empty" album included Rosemary Butler, Russ Kunkel, Lee Sklar and Craig Doerge. Having them all there just made the song so much more vibrant than I've heard it the past 15 years in other concerts. Graham Nash also sang some vocal on "Running On Empty." At this point in the show on the second night it was announced that a telegram had been received. I nice message of love to Nicolette and apologies for not being able to be there was signed by Hoyt Axton. Jimmy Buffett was next (2nd night only). Jimmy was in very good humor. He commented (after having seen Carole King on stage with her daughter and granddaughter that he wondered if that was what was in mind when the lyrics "go granny go" were penned many years ago! He also commented that this concert was very good "for a bunch of old farts." Jimmy jumped right in with a great version of "Margarittaville". Valerie Carter, Graham Nash and Rosmemary Butler did some great backup. Jimmy Buffett then said that Russ Kunkel had requested the next song which he hadn't sung in many years and so he had to spend a whole 6 minutes on it in rehearsal. He said that it was one of those songs that people thought was titled so profoundly, but that he had picked the phrase off of a bathroom wall in New Orleans. The song was "If The Phone Doesn't Ring, It's Me". Jimmy then finished with a spectacular rendition of Van Morrison's "Brown Eyed Girl". One change in the order between the shows was that at this point in the first night's show Paul Gurion came on to read a poem. The second night, he was moved up to just after Little Feat and Bonnie Raitt finished up early in the evening. I think the timing worked out better the second night. Paul read the Dylan Thomas poem, "Fern Hill" which he said he had discussed with Nicolette on a number of occasions. Linda Ronstadt came up next. She started with "Poor Poor Pitiful Me" with Graham Nash on harmonies. Then she sang "Blue Bayou" and "Ooh Baby Baby". The first night Linda looked like she was a bit confused. Like maybe she had been rushed on stage before she was ready. She seemed more "with it" the second night. But in both cases there was no problem with her voice. She has one of the clearest, most powerful voices in music today and she demonstrated that very strongly at these shows. Simply an amazing voice. Linda then brought out her good friend Emmy Lou Harris who took lead vocal for the song "Even Cowgirls Get The Blues". Singing along with her on this one were Linda Ronstadt, Bonnie Raitt, Valerie Carter and Rosemary Butler. Wow! Then Linda finished up with Jimmy Web's "Adios, Adios". Linda also commented on traveling on the road with your child. She is doing so these days and commented that Nicolette seemed to be the only other person she knew who did so -- excect of course for Jackson Browne who did so before it bacame fashionable. She seemed to really admire him for that. Linda was definitely another highlight for the night. And lastly, Crosby Stills & Nash took the stage. They started off with "Southern Cross" followed by "Half Your Angels", a song Graham wrote about the Oklahoma City bombing. Then they finished up with a really rockin' rendition of "Dark Star" which they commented was a good choice for tonight since they had Lenny Castro there to handle the percussion. (CSN was the only act besides Little Feat not to have The Section backing them up.) Dark Star is one of my favorites and this was one of the best versions I've heard of this one. Crosby Stills & Nash then did an encore of an acoustic (practically acapella) version of a song they introduced as being one of the very rare covers you'll ever see them do, by their favorite group: The Beatles' "In My Life". It made the spine tingle. Breathtaking. Then for the grand finale, EVERYONE came back on stage for Carole King to lead a version of "You've Got A Friend". Carole took the first verse. Bonnie took the second. Linda took the third. On the second night Jackson Browne and Bonnie Raitt were together at the far right microphone on this one. They were having a great time together. And Crosby Still & Nash were all gathered around the center microphone. Linda Ronstadt and Emmy Lou Harris had the far left microphone. 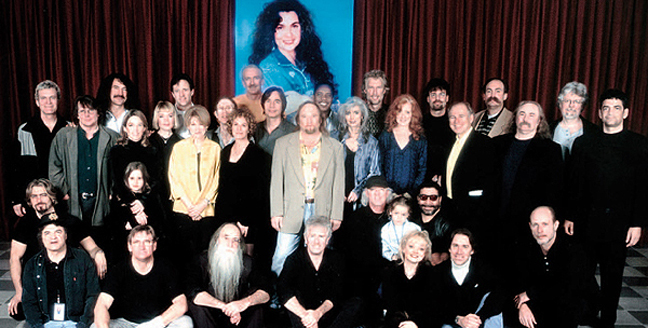 I noticed Dan Fogelberg, Joe Walsh and Jimmy Buffett at the back with Valerie Carter and Rosemary Butler and others. I'm out of adjectives with which to describe this performance. It was simply a couple of evenings of going from one magical moment to another. And you know what? There was someone there having more fun than anyone in the audience. Graham Nash. He was like a child in a candy store. The look on his face as he sang with one artist after another was wonderful to behold. His enthusiasm for the music and the artists with which he was performing was terrific. 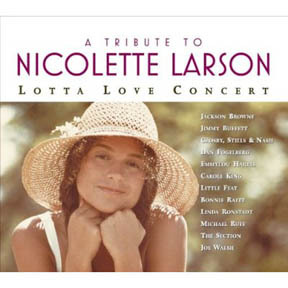 This was a very special tribute to Nicolette Larson who touched all of our lives with her music and her voice. And obviously she touched her friends much deeper still. I think the outpouring of love and support for Russell Kunkel and Elsie May Kunkel (who is as beautiful as her mother) was very heartwarming. I feel privileged to have been able to be there. By the way, it was great to see so many of you there. Seeing old friends and meeting new ones helped add to the special feeling of the two evenings. I wish you all could have been there.